"We saw the writing on the wall," one regulator said of the coordinated attempt to get ahead of the for-profit operator's eventual shutdown. On the evening of Dec. 4, Lane Goodwin, a program manager with the South Carolina Commission on Higher Education, saw an email from Education Corporation of America's (ECA) primary accreditor. The email notified the for-profit operator and affected state officials that most of ECA's colleges had their accreditation suspended. "I saw it and thought, 'Tomorrow is not going to be a good day,'" Goodwin said. It wasn't. On Dec. 5, after the Accrediting Council for Independent Colleges and Schools (ACICS) pulled ECA's accreditation, the company announced it would close nearly all of its campuses, including the Virginia College, Brightwood Career Institute and Golf Academy of America chains. The sudden wind down left students in the lurch, and it sent state and federal officials scrambling to help them with what tools they had. Goodwin and other state higher ed regulators that spoke with Education Dive said past for-profit closures prepared them to navigate ECA's abrupt shutdown, mainly by gathering records and student contacts before the lights went out. "We've been burned on previous closures like ITT (Technical Institute)," Goodwin said. "Unfortunately, I think we're all getting better at this." The swiftness of ECA's shutdown notwithstanding, many regulators were wary of the possibility of a broad closure weeks in advance, though the company gave no outward indication it was coming. Again, the closures of ITT, Corinthian Colleges and other for-profits offered lessons. Among the warning signs were ECA's entering receivership and its lawsuit against the U.S. Education Department. The lawsuit, in the view of the department and other observers, was effectively an end run around a bankruptcy filing, which would have blocked ECA accessing Title IV funds. At the time it filed the lawsuit, on Oct. 16, ECA said it owed Monroe Capital Management Advisors $19 million under a loan it took out the day before in order to make payroll for that week. It anticipated needing another $12 million by the first week of November and $7 million by the first week of December — the week it closed. ECA also owed more than 1,000 vendors and landlords a total of about $46.8 million, and it faced evictions at some campuses. Education Corporation of America's website shows options for former students. The Ed Department had put ECA locations on Heightened Cash Monitoring 2 status in November, meaning it lost access to advanced financial aid and had to request reimbursement from the government. Along with financial problems, ACICS cited concerns about "student progress, outcomes ... student satisfaction, certification and licensure, and staff turnover" in suspending ECA's accreditation. In Maryland, where 1,700 ECA students were affected by the closure of Brightwood campuses in the state, regulators in the fall started considering the possibility of a broader wave of closures. 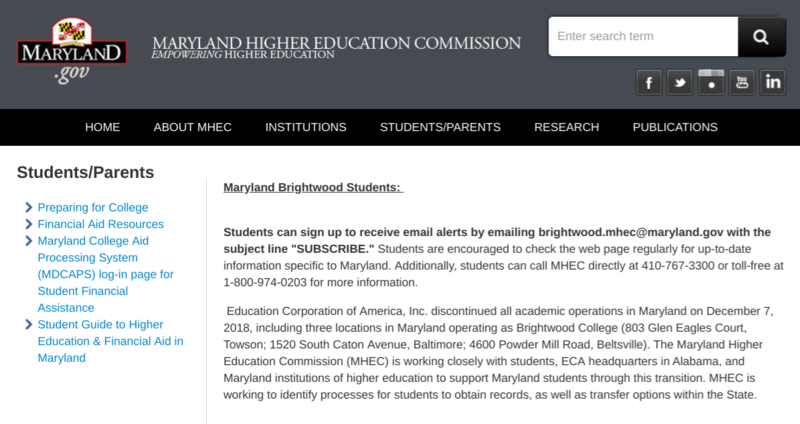 Emily Dow, assistant secretary for academic affairs for the Maryland Higher Education Commission (MHEC), said the agency had been in regular contact with ECA via phone and email prior to the closure and met with company representatives in November. ECA indicated to MHEC it intended to keep its Maryland campuses open even as it looked to shutter others as part of a restructuring plan. Even so, the agency started preparing for the possibility of closures, Dow said. Maryland wasn't alone in its concern about ECA. "We did not start our activities with the closure. We started the minute they went into receivership," said Cathie Maeyaert, a special projects director for the Texas Higher Education Coordinating Board (THECB). "We have learned that if a school does go into closure, it happens rapidly. Personnel disappear, resources disappear." After ECA went into receivership, the Texas agency immediately asked ECA for all student transcripts going back as far as possible, as well as for student email addresses, Maeyaert said. "We did not start our activities with the closure. We started the minute they went into receivership. We have learned that if a school does go into closure, it happens rapidly. Personnel disappear, resources disappear." The practical importance of obtaining transcripts before a college chain closes was yet another lesson from past closures. The state of Texas responded to ITT's closure with legislation creating a central repository for student transcripts. In that case, Texas secured student transcript records only after a legal tussle with the chain's bankruptcy trustee after the trustee took possession of them. "We spent a lot of time getting those back," she said. THECB is now filling the new repository with records provided by ECA. Several other states put in requests to ECA for student transcripts in the weeks leading up to its shutdown. Also helping states respond this time around was ECA's responsiveness to records requests and its presence at events held by state agencies to help students, said Scott Valverde, chief of California's Office of Student Assistance and Relief (OSAR). More generally, coordination among state agencies helped them prepare. 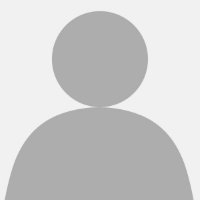 Various state regulators said they talked and emailed with each other about ECA in the weeks before it announced it would close. "We're all a pretty close group," Goodwin said. "I think we saw the writing on the wall." Even with states able to take some preparatory steps, ECA's shutdown created chaos and uncertainty for students across the country. In California, with between 2,500 and 3,000 students affected, the closure was the largest such event since OSAR's launch in 2017, Valverde said. The state created the office, which had a staff of seven as of early January, in part to deal with the ITT and Corinthian closures. After ECA closed its California colleges, Valverde and his staff canvassed the state, holding presentations at the campuses. He said his office has met with around 700 affected students in person to help them navigate their options and talked with "many more" over the phone. By far most student questions pertain to federal loan discharges and tuition reimbursement for cash payments, which California offers through a state fund paid by student fees, Valverde said. The state is also working with schools on a possible teach-out program for ECA's nursing students. "Nursing students are often very passionate," Valverde said. "They were blindsided by this." "It's not just about money but also the time they spent in those programs." The absence of predetermined teach-out plans for most of the campuses added to the frustration of students across the country. By the fall, ECA had plans to stop enrolling at more than 25 campuses and teach out the remaining students. But the sudden closure left many to transfer on their own. But Maryland's experience, which Dow attributed to her office's relationships with local colleges, was rare among the states Education Dive spoke with. In Texas, where nearly 4,000 students were affected by the closures, teach-out agreements were initially limited to one or two programs, though talks were continuing. Maeyaert also said a public community college was working on an agreement to transfer 11 students into two programs. The Maryland Higher Education Commission was among several state agencies to anticipate ECA's likely closure. In Indiana, where about 1,300 students were affected, negotiations with the state's community college system did not yield a teach-out deal, said Teresa Lubbers, commissioner of the Indiana Commission for Higher Education. "There may be another proprietary school [that could conduct a teach-out], but we don't know of any at this point," Lubbers said. "For some of these students, loan discharge may be a better option." She added, though, "It's not just about money but also the time they spent in those programs." In cases where teach-outs aren't arranged, there are still schools willing to scoop those students up. In Indiana, for example, ECA's website lists several for-profit colleges that might take former students. But even if they do, students may not be able to transfer all of their credits. Valverde said a "fair percentage" of students he's talked to or overheard said many schools in the area weren't accepting large shares of their ECA credits. Questions also linger about the educational quality at schools putting out the welcome mat for ECA students. Yan Cao, a fellow with The Century Foundation, said the need to transfer quickly because of a closure can lead students to "double down" on low-quality for-profit colleges by transferring to another — which may have its own problems. ECA itself, she noted, once took on students displaced by the ITT closure. Even with advanced preparation, states can't stem all aspects of the closure fallout, and they are limited by the tools at their disposal and the scope of their respective agencies. Some states say they've heard little from ECA students. In Florida, where ECA enrolled more than 850 students, the state's Department of Education had received few calls from students by the second week of January, according to a department spokesperson. A spokesperson for the Colorado Department of Higher Education said in an email that the department had received five complaints from students as of Jan. 15, most of them about the difficulty of transferring. Nonetheless, ECA operated more than 70 campuses and reached as many as 20,000 students. Very likely there are thousands of students who paid a steep price — in time, money or both — for enrolling in ECA, whether or not they have spoken up to state agencies or even fully understand those costs and their options yet. Those options are not perfect. Cash payments for tuition might be lost in states without any or sufficient recovery funds or surety bonds. If students choose to transfer to another school, they are ineligible for loan discharges for ECA credits not accepted by their new school, according to an Ed Department spokesperson. "A lot of students probably aren't in a position to start over. That would be too daunting." And while the department has notified ECA students that they can apply for federal loan discharges, Cao points out it hasn't informed them of borrower defense discharges, which were strengthened under Obama-era rules the Betsy DeVos Ed Department has tried to undo. Moreover, as Cao noted in a recent article for The Century Foundation, the department only recently — and after a lawsuit — authorized discharges for students affected by Corinthian's closure in 2015. Others have faulted the Ed Department for not heeding warning signs with ECA such as poor student outcomes, and also for not forcing ECA to provide a letter of credit as the department did with ITT to protect the potential loss of public money in a school failure. It's unclear yet how state agencies' advanced preparation will help students cope with ECA's closure, if at all. For students who want to continue their education, the choice can involve taking on even more debt, especially if they have burned through Pell or veterans benefits, Cao said. And the decision to go further into debt in order to begin again at another institution is a tough one to make. "A lot of students probably aren't in a position to start over," Cao said. "That would be too daunting."